Finally blog friends! A label for the beeswax lotion recipe I posted a few months back! Hopefully this will make a cheerful addition to your lotion jar and those you give out to friends and family. As with all my labels, print this pdf at 100% size on Avery Sticker Project Paper and cut out with scissors. These labels fit wide mouth jar lids. 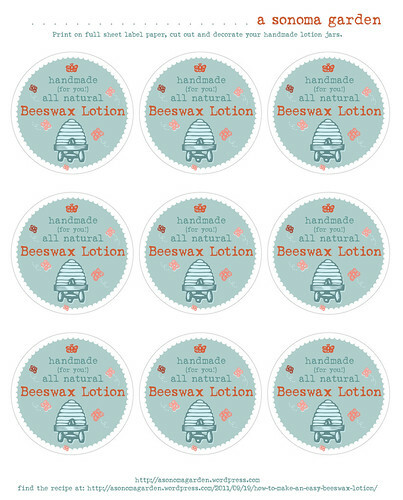 Download free printable beeswax lotion labels here. Speaking of the beeswax lotion recipe, I finally (finally!) weighted the beeswax. 1/2 c. of beeswax pastilles equals 2 oz. I will update the recipe. Also someone left a very helpful comment saying that if you add 2 t. of cornstarch to the recipe, it will cut the grease! What a great suggestion, I’m going to give that a try this afternoon. I wanted to mention, if you haven’t already noticed that I have Christmas label downloads too. Fun to add to canned goods or to print onto card stock and use as gift tags. Happy Printing! If you use these labels for your lotion, I’d love to see! Take a picture and send me a link in the comments! What a nice Thanksgiving weekend we had. The weather has been spotty. 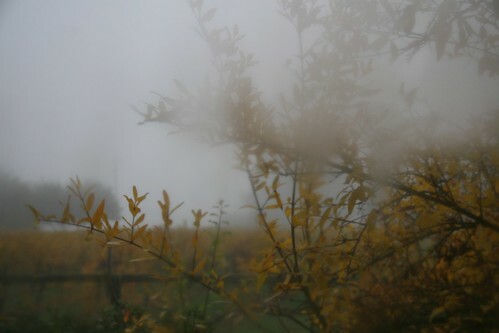 Sometimes rainy, we’ve had plenty of fog and even some beautiful sunshine. All of it must have made me stay inside, because when I downloaded my recent pictures this morning, many were pictures looking out windows, like this one. 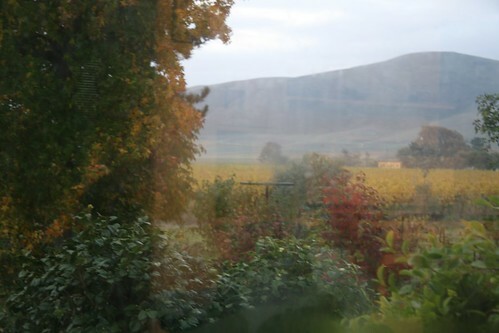 Even in the few short days since I took this photo, that maple tree has turned to all yellow and red. It’s gorgeous out there! The favas are starting to pop up, the walnuts are pretty much all harvested, and Scott has been trellising more berries and grapevines. Outside one of our bedroom windows is this pomegranate tree. I’ve always wanted a pomegranate tree, but could never find a place in our old garden. When we moved in this tree (or are they technically bushes?) had hundreds upon hundreds of blooms. I was starting to get worried about just how many pomegranates we’d get, but most fell off before setting fruit. We did however end up with enough pomegranates to fill a 10lb potato bag. With our recent rains we had to harvest them all because they were beginning to crack, and if left cracked on the tree they rot. What a waste that would be. So we’ve been eating them in snacks and especially in salads with freshly cracked walnuts and blue cheese. So good! What’s especially good is cutting them in quarters and juicing them with the help of our Juice King! 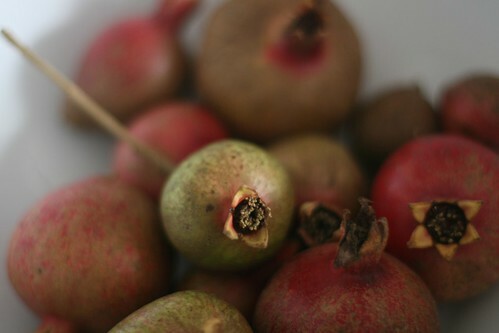 Now I’m off to find some recipes for pomegranate cocktails for tonight! I have something fun to share with you tomorrow and we are currently working on a new culinary project, which I’ll share with you soon! Nothing is more motivating, garden speaking, then a visit to the Sonoma Garden Park. It’s been a while since we’ve visited, but I’ve been missing it. 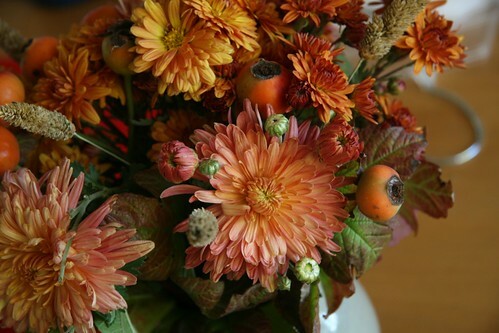 And since our attentions are starting to turn outside-wards, I was looking forward to the inspiration. Oh yes, nothing is more humbling and motivating than a visit to a beautiful garden. It wasn’t more than a few hours before we got home and got our hands in the dirt. 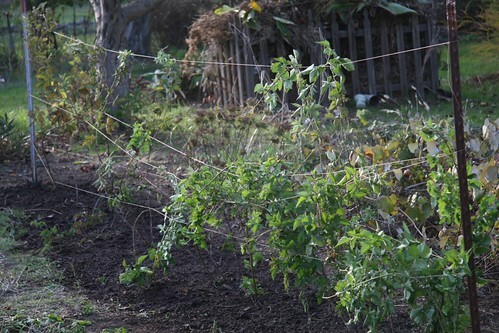 First up was to attend to this row of berries, to get them up and off the ground. A couple of stakes, some twine, some weeding and a good mulch of compost and we’re ready to be deep in boysenberries next summer! This above patch was the watermelon patch, which we put our seven year old in charge of. 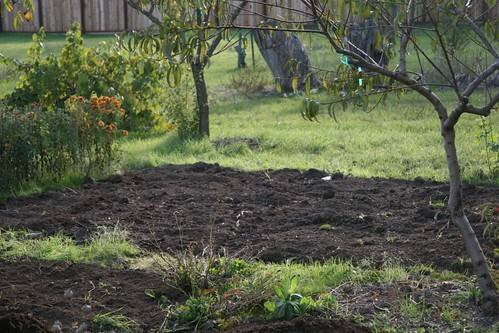 He pulled up all the old watermelon plants, dug up the dirt, smoothed it out and hauled the compost from the front of the house and laid a thick layer on top. He got a very big ice cream cone after that, believe me! This patch was my patch to tackle last week. We had wanted to lay a good cover crop, but it was overwhelming to know where to begin. We should have planted the fava beans weeks ago, but every time we walked out there, the job just seemed too big to tackle. So I put on a watch, grabbed my gloves and a shovel and just started digging, for 10 minutes. Then I went back inside for a while to work. Then back out to dig. Then back inside to tackle laundry. 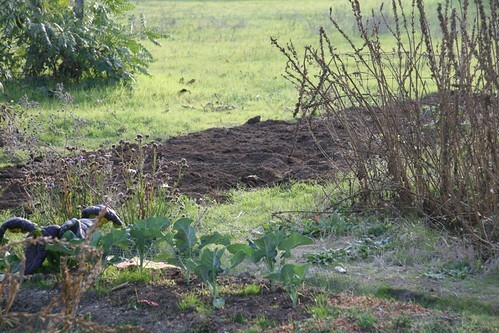 Then started hauling compost to dig in, for 10 minute segments. Then spread out gypsum to cut the clay soil and fava. Then another thin layer of compost. All in 10 minute segments. Got it done in two days. Of course this is only a tiny segment of what we hope to dig and put in cover crop, but hey, it’s a start! I just realized that my 7 year old works faster than I do…hmmm…guess that’s why I’m still waiting for my ice cream cone! p.s. We had another jar lid pop this Sunday. Again on a Sunday. Strange. This time from something canned two years ago with a different batch of lids…. 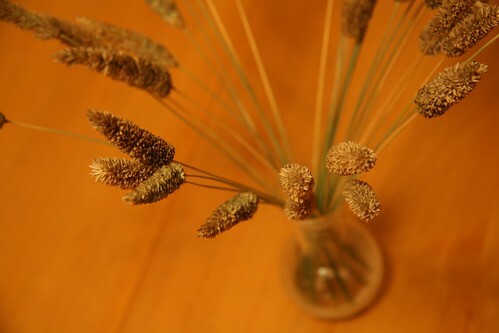 I feel so fortunate to have moved into a house with so many seasonal bouquet ingredients growing everywhere you look! I just love this time of year, everything is so beautiful outside. We’ve been making a list of garden tasks that need to be done before winter sets in…the list, it’s long! Since we’ve moved in we haven’t been able to spend as much time getting the garden going as we had hoped. Our focus has been on the house and hopefully we can get all our projects done so that the next growing season we can turn our thoughts fully to the outside. Because our focus has been off the garden we haven’t had as much to put up or preserve. This time last year, we had 26 quart jars of tomato sauce put up. 16 jars of peaches, 10 bags of frozen nectarines, and well over a dozen jars of jam in the pantry, catsup, chutney’s, barbecue sauces etc. This year we maybe got a measly amount canned or frozen. Nothing went to waste, we ate or gave away all our fruit, but we just didn’t have the energy or produce to do more. With the little we did get canned, we had a bit of a disaster. In fact what happen still remains a mystery. Last week, when our oldest was making his almond butter and jelly sandwich he ran out of jam. We reached for a new jar to find that the seal had popped. We reached for another one, that too had been broken. Seven jars, all their seals broken! These were all different jams, canned from different times of the year. As we tend to be a bit conservative on the food safety meter, we threw them all away, who knows how long they had been unsealed. Uhg. Then this past Sunday we were all sitting in the kitchen. Praire Home Companion was playing on the radio, I was cutting Scott’s hair, the boys were again packing their lunch snacks into little containers and we heard a loud ‘poink’ come from the pantry. Not again! Another jam lid popped. Those of you who do their own canning, know that ‘ping’ sound that you hear when the jars seal. It’s a soul satisfying sound that gives you an inner happiness. A happiness to know that the job you did was successful, that you have worked to preserve a little bit of summer that will nourish your family in the dark months, that you are somehow connected to previous generations, oh I could go on and on. Hearing that ‘poink’ sound of a jar unsealing randomly in the pantry gives you pretty much the opposite feeling. Do you have any idea why this happened? Our suspicion is that we got a bum package of lids. Only some of the lids have popped, so I don’t think it wasn’t some sort of atmospheric condition. It wasn’t a bad canning job, as they were different jams done over different times of the year. And this only happened with the small mouth jar lids, none of the large mouth lids have popped…yet! If you have any insight, I’d love to hear it.